Raisins or sultanas are the dried fruit of choice for the nation. They can be found in almost every supermarket, used in a wide variety of baked goods, and have a natural sweetness without having an overwhelming amount of sugar when compared to other dried fruits like pineapple and mango. Another reason sultanas are so popular is because of their versatility. Drop a sprinkling of sultanas in yoghurt or a smoothie, grab a handful as a quick snack or chop them before adding them to muffins. Really, you can do no wrong improvising with sultanas … unless you’re one of those people who find them revolting. In which case, why not consider the lesser-known goji berry? Just as wrinkled and shriveled as sultanas, goji berries have a slightly longer, oblong shape and are rusty red in colour. These berries are harder to come by, usually found occupying the shelves of health food stores rather than the local supermarket. These powerful little berries are a low-calorie and high-fibre snack offering a good amount of antioxidants to boot. They, like sultanas, are often eaten raw or added to other foods though they also come in liquid or powdered form. A serving of goji berries (about ¼ cup) has 104 calories, 1 gram of fat and 4 grams of protein, a relatively high amount for a fruit. They are packed with tons of beneficial nutrients: zeaxanthin, polysaccharides, vitamins A, E, C, B1, B2 and B6, flavonoids, amino acids, calcium, iron, potassium, selenium and zinc. One serving of goji berries has 180% of the daily value (DV) for vitamin A, 30% of the DV for vitamin C, 9% of the DV for calcium and 15% of the DV for iron. 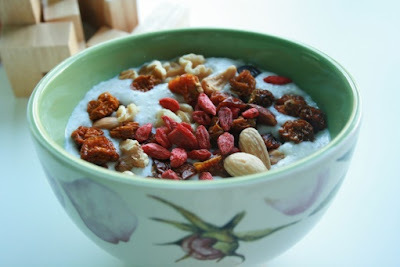 These fruits have been used in traditional Chinese medicine for centuries and are known as the “wolfberry fruit.” Studies have been conducted on the effects of goji berries, a fruit dubbed “superfood berries,” showing them to improve the health of gastrointestinal, bowel and musculoskeletal systems as well as improving cardiovascular health. Goji berries are recognised as a natural treatment for diabetes and can aid in combatting depression. 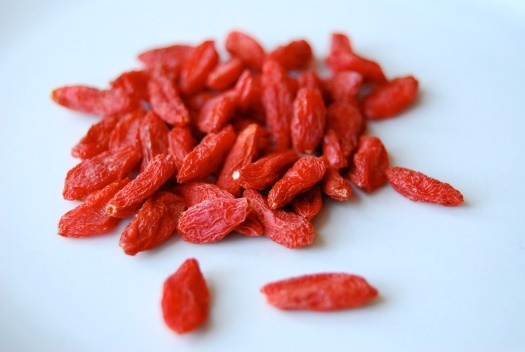 Along with these natural remedies, goji berries can nourish the blood. The little, red berries owe much of their abilities to a high level of antioxidants, beta-carotene, and phytonutrients. Eating them will give people “increased ratings for energy levels, athletic performance, quality of sleep, ease of awakening, ability to focus on activities, mental acuity, calmness, feelings of health, contentment, and happiness and significantly reduced fatigue and stress,” according to a study published in the Journal of Alternative and Complementary Medicine. A word of caution – studies examining the effectiveness of goji berries in treating diabetes should be taken with a grain of salt (1, 2, 3).